Spring is just around the corner (hopefully), which means it's time for me to start gathering up my garden supplies! Every summer I grow a variety of tomatoes - either from seed or unusual types I see at my local plant nursery. I've been on the search for PURPLE tomatoes for years, so if you know where to find those...hit a girl up! Last summer I grew a combination of beefsteak and yellow tomatoes. 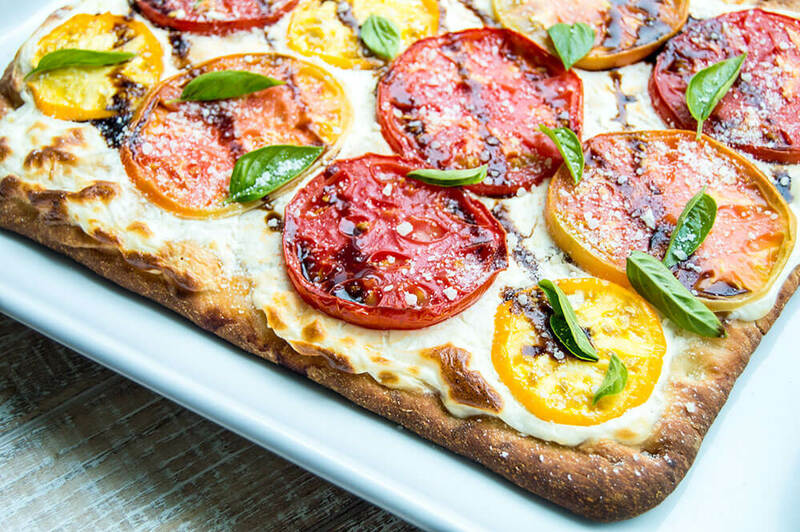 This tomato ricotta flatbread is simple enough to make. 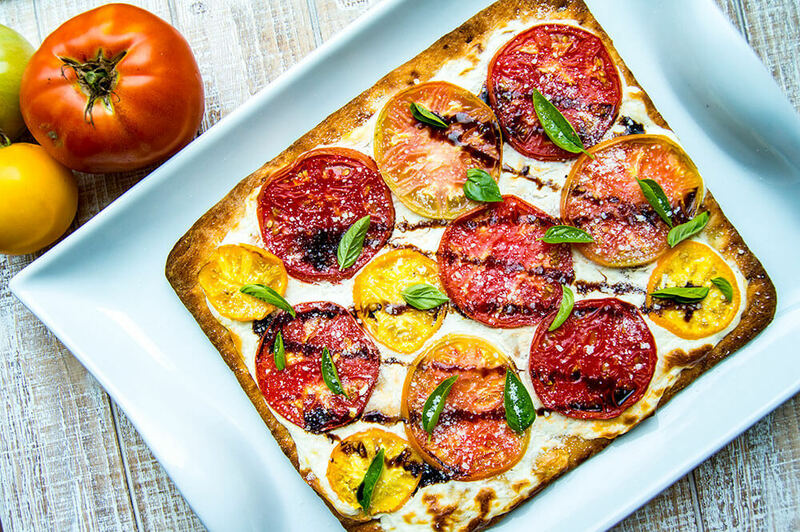 Take a basic pizza crust recipe or canned variety and top it with ricotta cheese, fresh tomatoes, a sprinkle of parmesan, salt and a balsamic drizzle. Of course, fresh homegrown basil to top it all of just pulls the whole thing together. Preheat the oven according to the instructions on the pizza dough packaing. Roll out the dough on a greased or parchment lined baking sheet. Press the dough into an even thickness all the way to the edges. Slice the tomatoes about a quarter inch thick. Set onto paper towels to absorb some of the liquid coming from the fruit. Discard the ends. In a small bowl, stir together the ricotta, parmesan, onion power, salt and sugar. Stir until smooth. Brush the dough with olive oil to the edges. Then spread the ricotta cheese across the dough, leaving a crust around the edges as desired. Arrange the tomatoes on the ricotta in an alternating pattern. 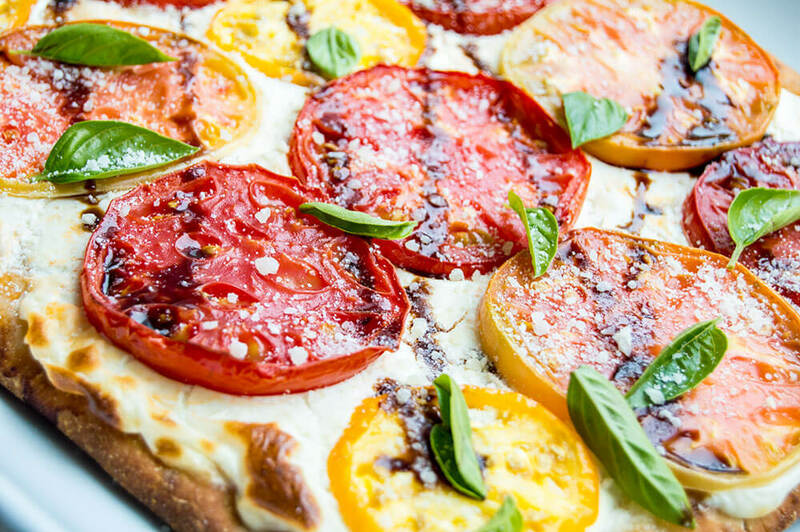 Bake for 15-20 minutes, until the tomatoes are starting to appear dried in the center and the crust is golden brown. 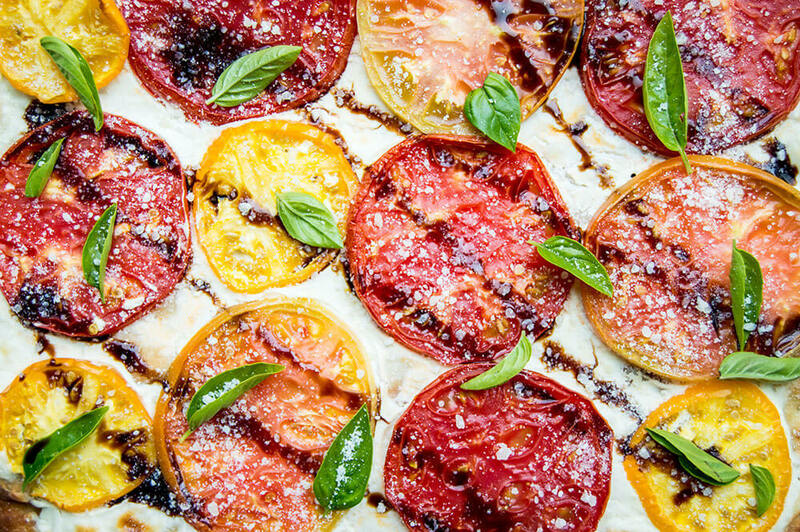 Drizzle with balsamic vinegar. Sprinkle on grated parmesan cheese, coarse sea salt and fresh basil leaves as desired. Serve warm or cooled to room temp. Enjoy!